Big data, ROI, content marketing, thought leaders, low hanging fruit. In the ever-evolving world of marketing, it can be impossible to steer clear of the eye-roll inducing buzzword. Buzzwords are written or spoken words that are technical in nature and have become popular to use, therefore are used very frequently in their nascence. For many, these words are cringe-inducing, but they are important to be mindful of, as they represent evolution of thought. Like all new words, some will live for only a short while and provide little utility (remember 'next gen? '), but others will go on to reshape an entire industry (we will never forget 'high engagement'). Buzzwords can be used in both good and bad ways, but ultimately it is important to be mindful of their purpose and possibility. 'To show our client that we are thought leaders, let's think out of the box and bring some gamifacation into the mix by creating an immersive and edgy experience for our consumer.'? Bad buzzword use occurs when imparted simply to impress. Use in this way tends to not impress anyone at all as everyone has access to the same industry resources that spread these words. While bad use does show awareness of the field, it does not provide utility in the conversation. Conversation is meant to be a collaborative process. When it is ambiguous, it fails. 'Our client has expressed interest in ROI measurement. Here is an example of how I envision this coming to life and providing value to our client.'? Good buzzword use occurs when affording ground for action. 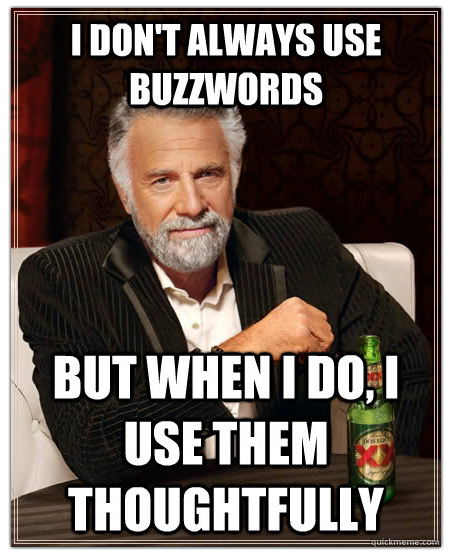 When discussing ways in which a buzz worthy topic can be useful for your clients, this is good use. If something unique is contributed, such as a relevant new tactic or deliverable, it displays boldness and creativity. Being able to align and excite a team around a plan, or having actionable results around those buzzwords communicates leadership. It is important to be cognizant of how buzzwords are being used. If bad buzzword use is taking place, consider how the conversation can be navigated to good use. Good use helps everyone involved become smarter, see opportunities before anyone else, and solve problems before they exist.